Its concentration of wildlife makes it “one of the greatest natural wonders of the planet,” but that’s just one reason it was named a UNESCO World Heritage Site. Ngorongoro Crater is the world’s largest unbroken volcanic caldera, measuring around 11 miles across and encompassing 102 square miles. It’s a beloved stop on most of our trips. Descending 2,000 feet from the rim of the crater is surreal and exploring the floor for some of the world’s best wildlife viewing is nothing short of spectacular. But there’s so much more to love. As a wildlife viewing location, Ngorongoro Crater is in a league of its own. Some 25,000 large animals call it home. That includes some endangered species that are rarely seen elsewhere, most notably the black rhino. There were just 10 black rhinos in the crater in the early 2000s. Now, the population has risen to more than 50, Chief Conservator Freddy Manongi said in June of 2018. That’s a significant amount considering the size of the crater. The area provides travelers with the best chance of seeing perhaps the most elusive of the Big Five. The large mammal population in the crater includes the densest population of lions on the planet. That’s no coincidence. A large population of lions needs a reliable food source. Thousands of zebra, wildebeest and buffalo live in the crater year-round and keep the lions well-fed. There’s a long list of animals that live in the crater. Here are just a few. Nearly all of Tanzania is a birders paradise. The Ngorongoro Conservation Area itself hosts 500 species of birds – a few too many to list in their entirety. Here are a few of the favorites. You may have noticed there are no giraffes or impala on that list of animals in the crater. That’s because the crater’s available food source isn’t suitable for either species. The crater’s lack of trees, aside from the Lerai Forest, plays a part in this. Fortunately, few trees and an abundance of short grass and flat terrain make it easy to see for miles around. You can find a black rhino even if it’s several thousand feet away, and when something exciting happens somewhere far off, you can often spot vehicles that have stopped to see the action and rush over to get a look. 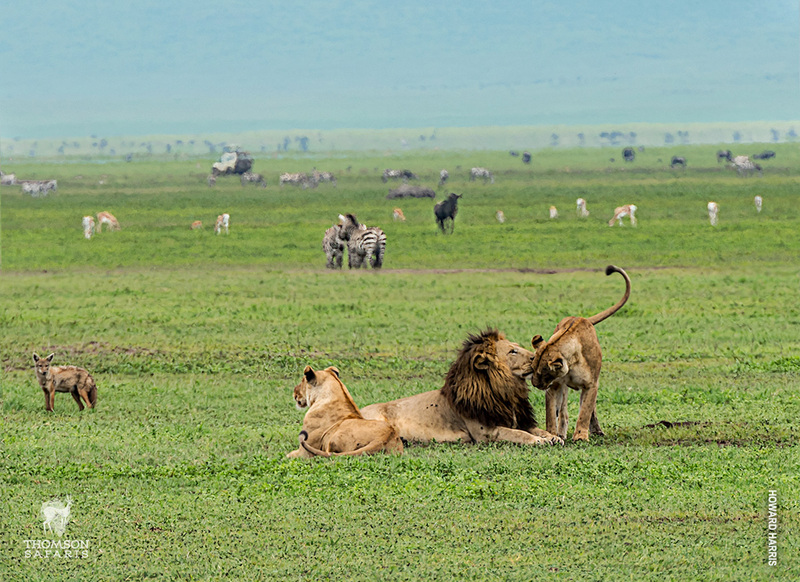 Even without the world-class wildlife viewing, Ngorongoro is a tremendous sight. Tanzania is the Best Country in Africa! © 2019 Thomson Safaris, A Division Of Wineland-thomson Adventures, Inc.
Ready to reserve your safari? Fill out the form below, and we will call you to confirm your reservation, answer your questions and personalize your stay with us for an unforgettable safari experience.